Thanks in part to our friend down under, Dave Jones, for finally convincing me to buy one, I'm now the proud owner of a second-hand high precision frequency reference (post 1, post 2). Now desperately searching for justification for the $50 I spent on eBay for my 10MHz Rubidium reference, I figured I'd dust off my extra class amateur radio license, hang it back on the wall, and start playing with RF electronics again. Possibly one of the most demanding amateur radio modes as far as stability is QRSS, which seems like an interesting place to start, or at least start working towards, since stability is an atomic clock's middle name. 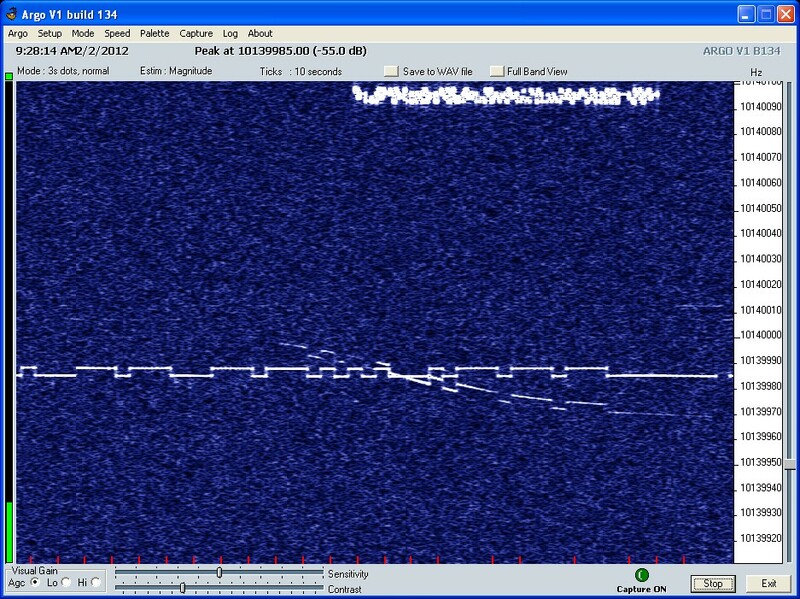 QRSS is extremely slow mode Morse code. Crazy slow. Mind-blowingly slow. Typical Morse code is sent at 12-25 words per minute, and has the rhythmic cadence to it which we're all familiar with via either experience or popular culture (example). 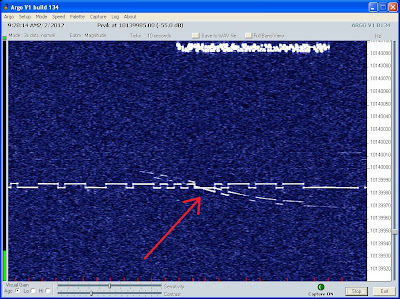 QRSS Morse code, on the other hand, is sent with single dits lasting on the order of seconds, if not minutes. QRSS is so slow, it's often easier to measure minutes per word instead of words per minute. Morse code is surprisingly still very popular in the amateur radio crowd, due to its huge advantage over voice communications in challenging situations where you need to deal with high levels of background noise or need to be able to decode very weak stations. This advantage can be exhaustively explained using Information theory (originally developed by the well-known Claude Shannon), but the argument essentially comes down to a matter of bandwidth. When you're having a voice conversation with someone else, you need to be able to hear a fairly wide range of frequencies. Human hearing ranges up to around 20kHz, but it turns out that human speech is actually fairly redundant above a few kHz, which is how telephone companies can get away with only transmitting the bottom few kHz of a conversation. Your ever-nagging parents are still perfectly intelligible over the phone, but lack the depth and quality of speech which you have to put up with in person*. Typical voice communications over amateur radio are 2.8kHz wide. This means that however much RF power your transmitter is putting out is being very carefully spread across a 2.8kHz wide range of frequencies. Morse code, on the other hand, consists of keying on and off a single pure sine wave, meaning that any spread in frequency is due to simply keying the signal on or off (or poor transmitter design). Very good Morse code filters are designed to listen to a range of frequencies as narrow as 30Hz. If you're transmitting a signal, and you can fit it into 30Hz instead of almost 3kHz, you've got an almost 100x power/Hz advantage, making your equally powerful signal seem significantly more powerful and easier to understand on the other side. QRSS takes this argument to the extreme. Why waste power splattering your signal over 30Hz of bandwidth when you can instead transmit within only a couple hertz or even less than a single hertz? Of course, to keep your signal that narrow, you're going to need to send less information, so while typical Morse code is sent at 12+ WPM (words per minute), why not slow that down to the point where sending even just your call sign takes a solid 5+ minutes. All of a sudden, you can be heard at mind-blowing distances using a trivially small amount of power. Now, this isn't quite right; it is probably safe to assume that both our signal source and receivers are stationary, since it's kind of hard to get a couple dozen meters of copper wire hanging between a couple trees moving in pretty much any direction at 400m/s. Considering that the original signal is still present throughout the window, it's clear that this shift is caused by the radio waves bouncing off of something else, which means that it's experiencing two Doppler shifts; one from the objects relative velocity to the transmitter, and a second from the relative velocity of the object to KK7CC's receiver. There isn't a perfect way to distinguish these two values without more information, but a reasonable approximation is to simply divide the Doppler shift and resulting velocity in half, giving us 221.8 meters per second, or 496 miles per hour (for the unwashed in the audience). So I'll leave you with this question: What in the world could possibly be going at almost 500mph, could pass between two amateur radio stations both based in the continental US, and that is clearly conductive enough to reflect radio waves? Ignorant question: could the reflection have been from a large airliner? Good job! That was my guess.